No one expected this. It was a team in just it's seventh season. It was a team which had never made the playoffs. It was a team which had never even posted a winning record. 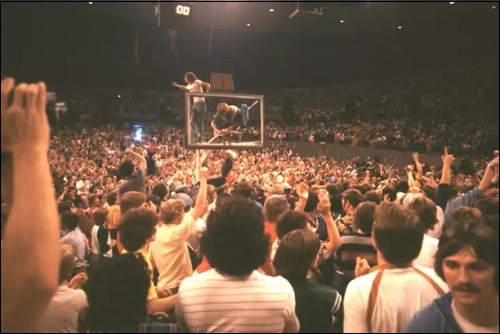 But on that Sunday afternoon in Portland, Oregon on June 5, 1977, the Trail Blazers shocked the basketball world when they won the NBA Championship. When they clinched the Game 6 win over the Philadelphia 76ers, 109-107, it completed a series comeback after being down two games to zero. It's a feat which had rarely occurred in professional sports, and still is considered an anomaly today. The 76ers (50-32) were the first seed in the Eastern Conference. They defeated the fourth seeded Boston Celtics in the Conference Semifinals (4-3) and dispatched the second seeded Houston Rockets in the Conference Finals (4-2). They finished the playoffs with a record of 10-9. The Blazers (49-33) were the third seed in the Western Conference. To reach the Finals, they defeated the sixth-seeded Chicago Bulls (2-1) in the first round of the playoffs, bested the second-seeded Denver Nuggets (4-2) in the Conference Semifinals, and swept the Los Angeles Lakers (4-0) in the Conference Finals. They finished the playoffs with a record of 14-5, without losing a single game at home. The teams had split their four-game regular season series, with each team winning at home. The Blazers blasted the 76ers in their first game, 146-104. The 76ers came out with a 108-107 win in the second match up. The Blazers won the third game by a 108-107 score. The 76ers took the fourth game, 128-106. Portland's 1976-77 roster looked quite a bit different than it had the season before; both on the court and on the sidelines. Dr. Jack Ramsay, a veteran NBA coach, had been brought in to replace Lenny Wilkins. Ramsay would go on to coach the team for 10 seasons. Jack McKinney replaced Tom Meschery as the assistant coach. Only five of the 12 players from the 1975-76 season returned; center Bill Walton, forwards Bob Gross and Lloyd Neal, guard Lionel Hollins and guard/forward Larry Steele. Among the departed players was the first Blazer ever, guard Geoff Petrie, and big men Sydney Wicks and LaRue Martin. Portland benefited from the American Basketball Association's merger with the National Basketball Association and the ensuing ABA Dispersal Draft. The Blazers were able to acquire Maurice Lucas from the Spirits of St. Louis, and Dave Twardzik from the Virginia Squires. Lucas was a 6'9" massive power forward who would be known to Blazers fans as "The Enforcer." Twardzik was a 6'1" point guard who, like Lucas, would become a starter for the Blazers in his first season with the team. Veterans Corky Calhoun (forward) and Herm Gilliam (guard) were added to the team. The Blazers selected forward Wally Walker with the fifth overall pick in the 1976 NBA Draft. They took guard Johnny Davis in the second round with the 22nd overall pick, and added undrafted rookie center/forward Robin Jones to back up Walton. Walton was named NBA Finals Most Valuable Player for the series. He would also be the NBA MVP during the following season. Despite having never reached the playoffs, the championship run in 1977 sparked a string of more than 20 straight playoff appearances. The Blazers' championship ignited Portland and the entire state of Oregon. Per reports, signs of "RIP CITY" and "RED HOT AND ROLLIN'" were abound in all over and there was not an Oregonian or Southwest Washingtonian who was not effected by the term which became known throughout the land as "BLAZERMANIA." According to this, with whom I've spoken, much of that Blazermania still exists today. To date, the Portland Trail Blazers have just one NBA championship. The aforementioned Blazermania and it's Blazermaniacs are continuing to clamor for number two (and beyond). They team advanced to the NBA Finals in 1990 and 1992, falling to the Detroit Pistons (4-1) and Chicago Bulls (4-2), respectively. They made it to the Western Conference Finals in 1991 and in 2000, both times being eliminated by the Lakers. Other NBA teams have won championships, and some of them have won it multiple times. Despite this being the Blazers lone title, it remains a great moment in Portland and Oregon sports history. Perhaps it's because it is the only title makes it more special to those Blazermaniacs. In researching this, I have learned of the spirit of Portland sports fans, and Blazers fans in particular. Respectfully, the love that the region has for their Blazers is likely unmatched across the NBA and professional sports. Here, we have tried to encapsulate that season, the playoffs and the finals. We have summarized the series, the stats and the teams. We also have put together a photo gallery and video collection. Additionally, My Q&A with our site consultant Bannock illustrates what is was like in Portland at the time leading up to the championship. On this 40th anniversary, we take a look back at that special team and this special community who embraced them. The Finals opened in the Spectrum on Sunday, May 22. 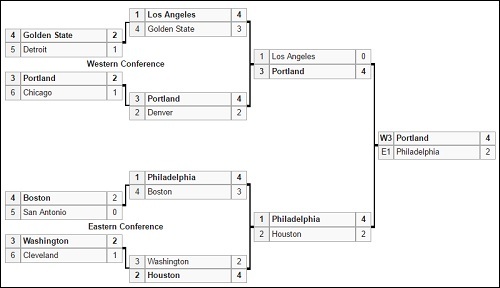 The 76ers seemed unbeatable after the first two games. Erving opened Game 1 with a stupendous dunk off the opening tip. He finished with 33 points and Collins had 30 as Philadelphia won 107–101. The Blazers were rattled enough to commit 34 turnovers. Walton finished with 28 points and 20 rebounds. In Game 2 four nights later, the Sixers won handily, 107–89. Jones and Dawkins handled Walton easily, while the Sixers dominated in the second quarter, scoring 14 points in one three-minute stretch on their way to a 61–43 halftime lead. The game became very physical with about five minutes left. 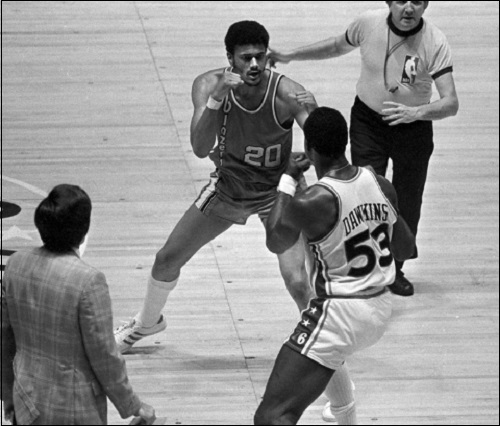 First, Portland's Lloyd Neal and McGinnis squared off, followed by Lucas and Erving trading elbows, then Lucas and Dawkins squaring off near mid-court. In Game 3, played on Sunday, May 29, Lucas strode directly to the Philadelphia bench, then startled everybody, including Dawkins, by sticking out his hand for a shake. The Blazers had a high scoring attack to win the game. Lucas contributed 27 points and 12 rebounds. Walton had nine assists, 20 points, and 18 rebounds. Twardzik, too, had returned to speed, driving the Portland offense along to a 42-point fourth quarter. They won 129–107, closing the series gap to 2–1. In Game 4, Portland opened up a quick 17-point lead, then cruised to a 130–98 win. Walton was sent to the bench with five fouls in the third. With a little more than eight minutes left in Game 5, Portland led 91–69 and the crowd was headed home. Erving rallied the Sixers to make it respectable at the end, 110–104. He had managed 37 points in the game. Gross scored 25 points to lead the Blazers, while Lucas had 20 with 13 rebounds. Walton finished with 24 rebounds and 14 points. In the sixth and deciding game, Walton had 20 points, 23 rebounds, eight blocks and seven assists. 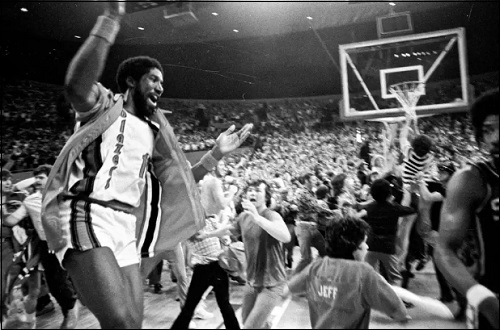 The Portland lead was still 12 with half of the fourth quarter left when Erving led his teammates on one final run. At the four-minute mark, the lead was cut to four, 102–98. McGinnis hit a jumper, and the lead was only two points with 18 seconds left. The Sixers needed a turnover, and they finally got it from McGinnis, who was able to force a jump ball with Gross. With eight seconds remaining, Erving put up a jumper in the lane but missed. Free got the ball and lofted a baseline shot and missed too. With a second left, McGinnis tried to force a seventh and deciding game but he missed. Walton knocked the loose ball away and ripped off his jersey, and hurled it into the crowd. Maurice Lucas and Darryl Dawkins square off late in Game 2. Blazers radio announcer Bill Schonley and commentator Terry Dischinger call the last 10 minutes of the deciding Game 6. In game 2, After a violent take down of the Blazer Bob Gross on a rebound attempt by Darryl Dawkins, the Enforcer, Maurice Lucas, stands up for his teammate in a move which most analysts say flipped the momentum of the series toward Portland. Blazers center Bill Walton and radio play-by-play legend Bill Shonely recount the championship run. Introductions at the 40th anniversary celebration ceremony at the Moda Center at the Rose Quarter. 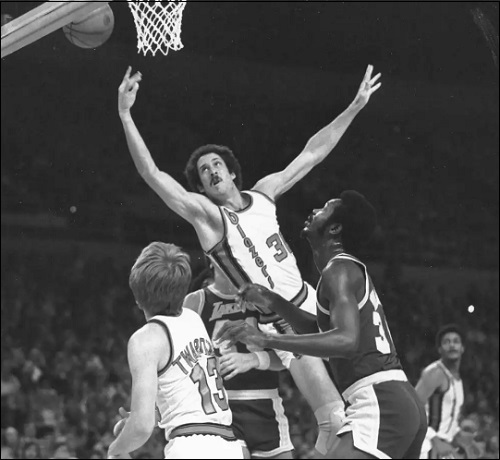 Corky Calhoun (F) - Calhoun, who had played for the Phoenix Suns and the Lakers prior to signing with Portland prior to the 1976 season, would stay with the Blazers for another season before being traded to the Indiana Pacers. He was released in the middle of the 1979-80 season. After considering playing in Europe, he accepted a job offer from the Mobil Oil Company (now Exxon Mobil). He currently serves as vice president of marketing at Capital Petroleum Group, LLC. Johnny Davis (G) - Davis went on to play nine more seasons with the Pacers, Hawks, and Cavaliers. He served several seasons as an assistant coach, including two seasons with the Blazers in the mid-1990s. Ironically, he became head coach for the 76ers for the 1996-97 season. He also served as head coach of the Orlando Magic for the better part of two seasons, and as an interim head coach for the Memphis Grizzles during the 2008-09 season. He was later replaced in that role by his former Blazers teammate, Lionel Hollins. Herm Gilliam (G) - The 1977 championship capped an eight-year playing career for Gilliam, who had played for five separate teams during that span. He went on to work for the United Parcel Service, and was promoted to manager of UPS's Corvallis-Albany (Oregon) hub. Gilliam was the first of the championship team members to pass away, of a heart attack, on April 16, 2005. Bob Gross (F) - Gross, who was the Blazers high point scorer in the championship-clinching game, played for the Blazers from 1975-76 through 1981-82. He went on to play a season for the San Diego (now Los Angeles) Clippers. Following his playing career, he has worked in the construction business since his retirement. He contributes to his status as a member on the championship team by playing in 15-20 golf tournaments a year to raise money for charitable causes. Gross shares (with Terry Porter) his retired number 30 by the Blazers. Lionel Hollins (G) - Hollins played for the Blazers through the 1979-80 season. He would go on to play for five more seasons in the NBA; for the Philadelphia 76ers, San Diego Clippers, Detroit Pistons and Houston Rockets. He spent several seasons as an assistant coach. He served as head coach of the Vancouver and Memphis Grizzles in 1999-2000 and in 2004 on an interim basis, and on a regular basis from the 2009-13 season through the 2012-13 season. He led the Grizzlies to four playoff appearances, including a trip to the Western Conference Finals in 2012-13. Hollins served as head coach of the Brooklyn Nets for a season-and-a-half from 2014-15 to 2016. Robin Jones (C) - Jones, who served as Bill Walton's backup during the championship season, played the following season for the Houston Rockets. He moved on to play in Europe for Olympque Antibes and Team Talbot Guildford for a collective five seasons. He would return to the United States and work for Anheuser-Busch. After suffering a stroke in 1995, he returned as the company's director of marketing. Jones passed away on June 16, 2018. Maurice Lucas (F) - After playing for three seasons in the American Basketball Association, Lucas signed with the Blazers during the 1976 off season. He continued to play for the Blazers through the 1979-80 season, and again in the final year of his playing career in 1987-88. In the interim, he also played for the New Jersey Nets, New York Knicks, Phoenix Suns, Los Angeles Lakers and Seattle SuperSonics. He served as a Blazers assistant coach during the 1988-89 season and also 2005-06 through 2009-10. Lucas passed away of cancer at his Portland home on October 31, 2010. His son, David Lucas, played college basketball for Oregon St. University. Lloyd Neal (F) - At the time of the 1977 championship, Neal was the second-longest tenured Blazer. At 6'7", he played both forward and center for the Blazers. He played for the team for two more seasons, though a knee injury early in the 1978-79 season would cut his career short. Following his retirement, he earned his college degree in 1980. He went on to a long-term tenure for the Internal Revenue Service in Portland in 1985. Larry Steele (F/G) - Steele was the longest-tenured Blazer, having been on the roster since the team's second year of existence, 1971-72. He retired after the 1979-80 season. All nine of those years were with. Appropriately, he led the NBA in steals per game the first two seasons the stat was kept, with 2.7 in 1973-74 and 2.4 in 1974-75. Following his retirement, Steele worked in the Blazers front office and worked as a radio commentator alongside Bill Schonley, and with CBS. He was the head coach for the University of Portland Pilots men's basketball team from 1987 to 1994. He continues to run a basketball camp in Vernonia, Oregon. Dave Twardzik (G) - Twardzik, who played for the American Basketball Association's Virginia Squires for the first four years of his pro career, was in his first season with the Blazers during that championship year. He played three more seasons with the team before retiring in 1980. He worked in the Blazers front office before serving stints as an assistant coach with the Detroit Pistons, Charlotte Hornets, Los Angeles Clippers, Golden St. Warriors and Denver Nuggets. He worked with the Orlando Magic for 10 seasons, the first two as director of player personnel, and the final seven as assistant general manager. Wally Walker (F) - The Blazers' number five pick in the first round of the 1976 NBA Draft, Walker went on to play for the Seattle SuperSonics for five seasons, appearing in the finals with Seattle in 1978 and 1979, and winning another title in the latter year. He played for two seasons with the Houston Rockets and for another season for Simac Milano in Italy. He returned to the NBA and was named president and general manager of the Sonics in 1994; a post which he held for 12 years, featuring a trip to the finals and and several playoff runs. He also served as president of the Seattle Storm, winning the WNBA championship in 2004. 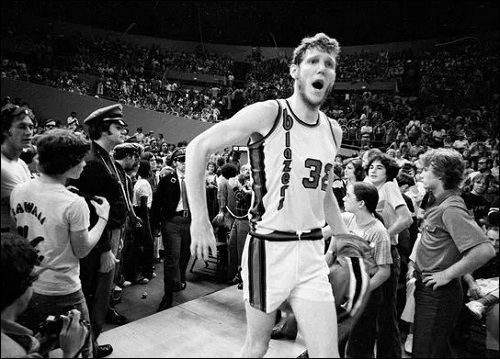 Bill Walton (C) - Walton, the number one overall pick in the 1974 NBA Draft by the Blazers, had a bumpy road in the league over the next few seasons. He missed 1978-79 with a foot injury. He moved on and played 14 games the following season with the San Diego Clippers. He missed the subsequent two seasons due to the foot injury, and came back to the Clippers for three seasons, including in 1984-85 when they had moved to Los Angeles. He finished his career in two seasons with the Boston Celtics as the backup to Robert Parrish. The Celtics won the championship following the 1985-86 season, during which he won the NBA's Sixth Man of the Year award. 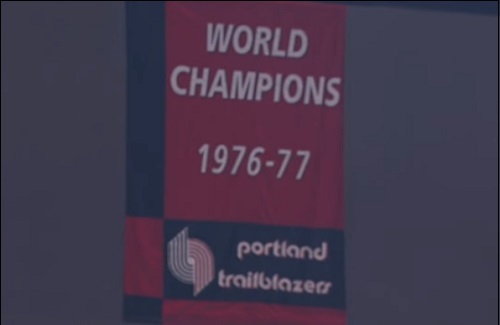 Walton and Walker are the only players from the 1977 Blazers team to win a second championship. Over the past three decades, he has worked in broadcasting for NBC, ABC/ESPN, and the Pac-12 Network. 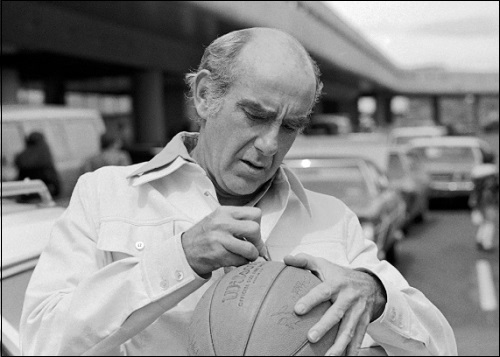 Jack Ramsay (Head Coach) - "Dr. Jack" had coached in the NBA for the Philadelphia 76ers and Buffalo Braves nine years previous to joining the Blazers, continued to coach the Blazers through the 1985-86 seasons before moving on to coach the Indiana Pacers. He turned to broadcasting, working as a commentator for the Philadelphia 76ers and Miami Heat. He also worked for several years as an analyst for ESPN. He has a street near Veteran's Memorial Coliseum in Portland named after him (see below), and Dr. Jack's pub is located on the Moda Center at the Rose Quarter campus, across from the arena's main entrance. Ramsay passed away of cancer on April 28, 2014 at the age of 89. Jack McKinney (Assistant Coach) - McKinney would go on to serve stints as head coach of the Los Angeles Lakers, Indiana Pacers and Kansas City (now Sacramento) Kings. Just fourteen games into the 1979-80 season, he suffered a near-fatal head injury in a fall from his bicycle. Recovery from the injury took longer than anticipated and he would not return to the Lakers. He would get some redemption the following season as head coach of the Indiana Pacers by winning NBA Coach of the Year. McKinney had succeeded Jack Ramsay as head coach of the St. Joseph's University men's basketball team. McKinney co-authored a novel about his experiences at St. Josephs, with 10 percent of the proceed's of the novel going to the university. McKinney passed away on September 25, 2018. Ron Culp (Trainer) - Culp, not just an athletic trainer, but the travel coordinator for the team, would continue with the team for several seasons through the 1986-87 season. He had started his NBA career as trainter for the Cleveland Cavaliers, a fellow expansion team of the Blazers, in 1970-71. He moved on to the expansion Miami Heat, where he spent over 20 seasons in the same capacity. He was the trainer for the Heat as they won the 2006 NBA championship. Culp is the only trainer to be honored three times as NBA Trainer of the Year. Culp was a trainer for the United States in the 1994 World Championship held in Canada, and a trainer for the United States Olympic team which won the gold medal at the 1996 Olympics, which were held in Atlanta. "On top of the world! What a view! What a feeling!" - quoted from Oregon Journal sports editor George Pasero. "You know those slacks Jack Ramsay is wearing today -- those are the kind you could throw in a shower and not worry about how they would come out. That's how confident this franchise is today. They dressed accordingly." - Broadcaster Brent Musburger in reference to coach Ramsay's fashion sense. “I think all of us wondered what might happen in this series after those first two games at Philadelphia. There’s no wondering now: this is going to be a marvelous showdown.” - Musburger, after the Blazers won game 3 of the series. “I have never seen a man start any better on defense than Walton has in this game,” Musburger in regards to Walton in game 5. “If you talk to people who have been around the league, they’ll tell you that if Bill Walton would have been healthy for a longer period, he might have gone down as the best center ever.” - Blazer broadcaster Bill Schonely, regarding Walton's career. "Between that season and the next, it was probably the greatest stretch of a center that I ever saw play. 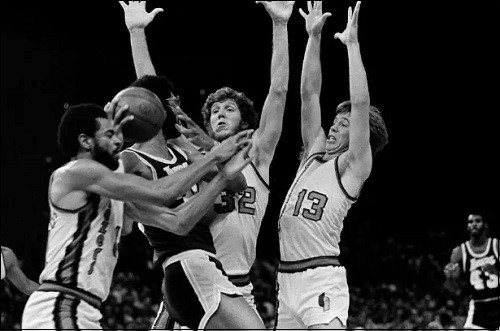 He did virtually everything.” - Mike Dunleavy, 76ers 1976-77 rookie and later Blazers head coach. "He came in way overweight. I’m sure he’d heard that he needed to put some bulk on. So he put on about 30 pounds of fat. He said he did it by drinking beer." Bob Gross on Walton. “I think for this particular group of players, an eclectic group, Portland was perfect. We had all these different things that we were doing in our personal lives, but when it came to representing the Trail Blazers, we were all one. We lived that way, we practiced that way, and we came to know each other that way.” - Blazers rookie guard Johnny Davis. “There was a void to be filled. And we stepped into it, and people started rallying around us. The love affair began at that point, and it continued." - Lionel Hollins. “That ride was a total freak show. He was the most renowned athlete in the world, basically—especially in Oregon. So we’re going down 101, and cars are practically driving off the road when they’d see him. ‘Was that Bill Walton?’ Guys on bikes going the other direction would turn around and ride with us for a while, Winnebagos would pull over to talk to him. He got pulled over in Lincoln City, and the cop let him go.” - Oregon writer Larry Colton, on a bike ride he took with Walton following the championship. In a bit of a pun, Maurice Lucas attended Schenley High School in Pittsburgh, Pennsylvania. He would go on the play for the Blazers, whose radio broadcast's play-by-play announcer was Bill Schonley. Blazers-Pacers connection: The Indiana Pacers had only two winning seasons in their first 13 seasons in the NBA following the NBA/ABA merger. The first was in 1980-81 under Jack McKinney, and in 1986-7 under Jack Ramsay. Head coach Jack Ramsay is referred to as Dr. Jack because he earned his doctorate degree in Education from the University of Pennsylvania in Philadelphia. Julius "Dr. J" Erving was the NBA All-Star Game MVP in 1977. 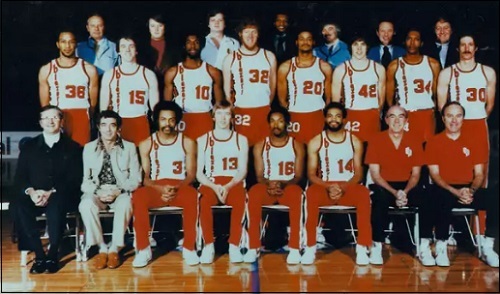 The Blazer are the first team to win the championship following the ABA-NBA merger. Bill Walton played for the UCLA basketball team from 1971-74. The quarterback of the Bruins' football team in 1972 and 1973 was Mark Harmon, who is now the star of NCIS. Caldwell Jones, the starting center for the 76ers in the series, played for the Blazers from 1985 through 1989. Bill Walton missed 17 games during the season. Twelve of those turned out to be losses. The Blazers had a 4-0 regular season sweep over their first round playoff opponent, the Chicago Bulls. During the regular season, the Blazers had three five-game winning streaks, and one six-game winning streak at the end of the season, culminating with a 145-116 drubbing over the Lakers in the season finale. Despite the 29-point win, it was the only regular season win over the Lakers. The Blazers would sweep the Lakers in the Western Conference Finals. 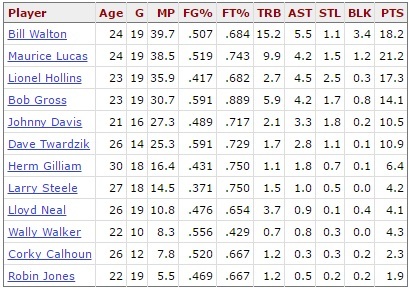 During the regular season, nine different Blazers led the team in scoring in any particular game. Typically, the post-game show would have followed the deciding game. However, dut to reports, CBS was not expecting results, switched to the Kemper Open golf tournament instead of showing the trophy ceremony. It is the last time the NBA championship trophy presentation was not shown on television following the game. 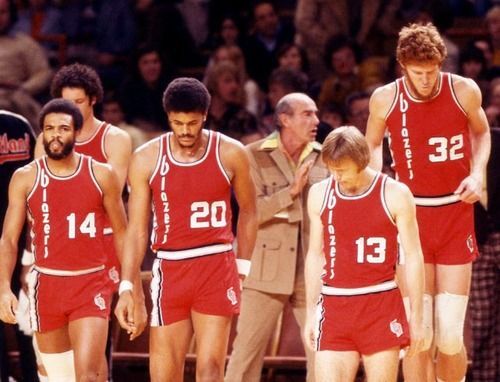 Of the three 1970 expansion teams, the Blazers are the first to win a championship. The Cleveland Cavaliers won their first title in their 46th year, in 2016. The third expansion team from that season, the Buffalo Braves, have moved to San Diego and then to Los Angeles as the Clippers, and have yet to win an NBA title. 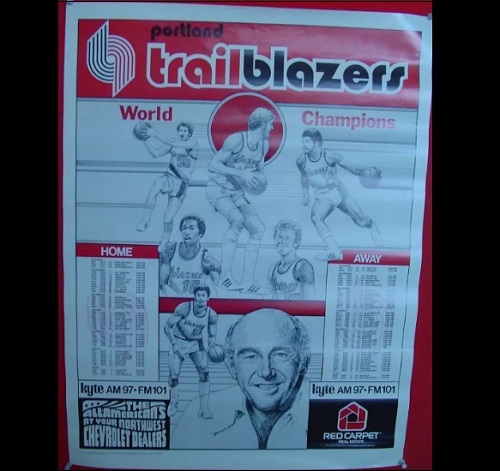 SCtoC Consultant Bannock was not quite 10 years old when the Blazers won the NBA Championship in 1977. He he shares his views in the answers to my questions below. What are your initial recollections about the championship season? Everyone was talking about the Blazers. I don't remember specifically, but as the playoffs approached and the team was progressing through, they were the top story in Portland on every TV broadcast. There were surely other stories about politics, crime, city government and other things, but The Blazers were always the top story. This became more prevalent over the course of the playoffs. You could not go anywhere, talk to anyone or overhear any conversation which did not involve the Blazers. Everywhere you went, you saw Blazers stickers and slogans on bumper stickers on cars and in store windows, and on the folders of my classmates at school. Where were you at the moment the Blazers won the championship? This is sadly ironic, but I was in Seattle. My grandparents were visiting from Mississippi. My grandfather was a huge baseball fan. He had listened to games on the radio, but had never seen a game in person. My dad, who was a reporter for KPTV at the time, had gotten tickets through one of the sports reporters there so that we could go to the game. It just happened to be on June 5. I believe we had he, my grandmother, my parents, my sisters and I were at the game. People in the stands were even into the Blazers vs. the 76ers game that day, People at the stadium in Seattle were trying to get updates using transistor radios. We tried, but did not have success. Whenever someone had an update of the score, they would yell it out in the stands. It was incredible. Even in the stands of a Mariners game in Seattle, a whole lot of fans were even more into the game going on in Portland. I should also mention, the Mariners beat the Cleveland Indians that day, 6-1. What do you remember about the celebration after the championship was won? Frenzy. It was just insane, and that's what this city was about. It meant everything to Portland. They celebrated everything about it. We did not go downtown to the parade, but it was massive. Absolutely massive. 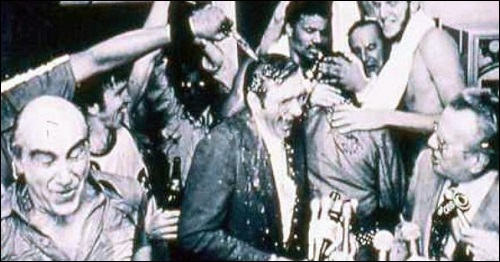 Jack Ramsay and the players were the toast of the whole region. The talk of the team I mentioned earlier was greatly amplified. The players were our heroes. They really promoted Portland well. 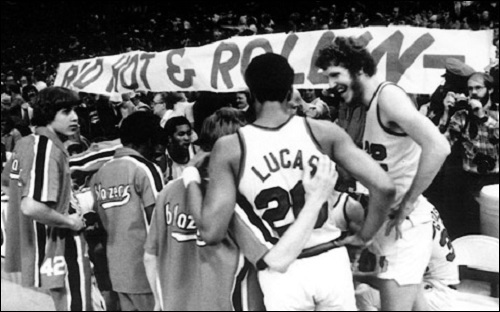 Guys like Bill Walton and Maurice Lucas, and really the rest of the guys, were adopted as Oregonians at that time. You have told us that you grew up in a Portland suburb. How was it in your neighborhood when the Blazers won that title? We were all excited. My family had a basketball hoop attached to our roof above our driveway, and we lived about three blocks from where I would end up going to junior high school. They had a full court basketball hoop in back of the school. My friends and I would shoot and play against each other, do our own commentary while trying to portray any of the Blazers players. Portland owned the championship. We continuously continued to emulate that. The Blazers have one NBA championship. Other teams have more. How does that affect your perception of that in relation to those other teams? What that Blazers did for the team and the city is unmatched. To the question, it means more because of how it ignited the city. You look at teams like the Lakers and perhaps the Celtics, who have won I think 16 or 17 championships each. Maybe there is an entitlement feeling there. We all know about David Stern's affinity for large markets. I think they were being essentially handed championships by the league in the name of promotion for the big market and superstars of the league. 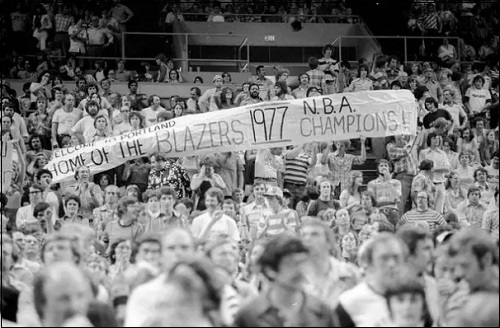 I, along with a lot of my fellow Blazers fans with whom I've talked, celebrate the 1977 championship because we feel it was won legitimately. How do the Blazer players from that season rank all time in Blazers history? At the top. 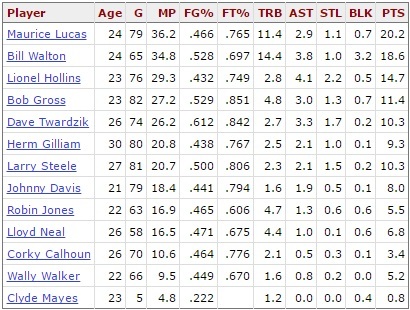 There was a terrific roster in the early 1990s, but that group of guys rank first in the Blazers' history. They bought into Jack Ramsay's system brilliantly. They were highly athletic. You look and hear about free-wheeling teams now like the Golden St. Warriors. 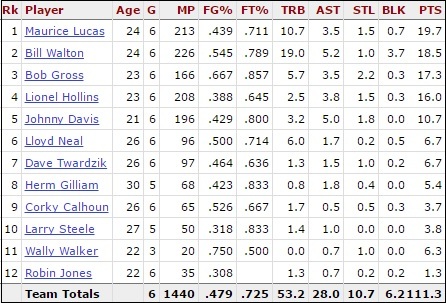 That Blazers team set the benchmark for a team like that. We know about Bill Walton and Maurice Lucas, but who is the most underrated player for that championship team? Bob Gross. No question about that. He did everything for the team. He was tasked with guarding Dr. J in the finals for starters. Dr. J was strong in the series, but Bob Gross made him work for everything. Let's not forget that he led the team in scoring in the deciding game six. He made Dr. J defend him. Throughout his career in Portland, he was a strong defender and capable scorer. Quite frankly, in the role of small forward, the Blazers have never found another Bob Gross. Jerome Kersey is a close second, but Gross gets that honor. What will your reaction be when the Blazers win the second championship? Pride. Great pride. I can foresee it as a frenzy, but it will be nothing like 1977. The reaction will be huge, obviously. It is so much more different now with social media, busy schedules and such, so it seems a bit diluted. I will tell that an NBA championship is long overdue for Portland. What could the team do better to enhance it's current chances to earn a second championship? They need to assemble a complete team. Damian Lillard and CJ McCollum are great players, and Jusuf Nurkic is a promising all-around center, but what they lack are the Bob Grosses, Lionel Hollines and certainly someone like Maurice Lucas to pair with a guy like Nurkic. The game is different now and while playing small ball can be fast, making some of these small forwards who are said to play in those roles extend themselves. Think about if Walton and Lucas were playing today in Ramsay's running offense, the Blazers would be dominating that. Seriously, could (the Warriors) Draymond Green really battle Walton in his prime? Not even close. I began following the Blazers as the college roommate of SCtoC founder and Portland native, Kasey and I have followed the team from Southern California. How does it feel to be able to follow the Blazers from outside of Portland? I've lived in Central Idaho, The Dalles and Hood River. I also lived in Orange County, California for over 10 years. Through online information, it's been fairly easy to follow the team. It's nothing like going to a game and seeing in person the new incarnation of the team. Since I moved back from California a couple years ago, I have attended about 10 games in person. I've also had a chance to watch every game. I've missed a few, but to be able to have the local access is terrific. That is, unless someone does not have Comcast or is unwilling to pay extra to see the games. Forty years ago, a local station only would broadcast about 20 games a season, and those were all away games. 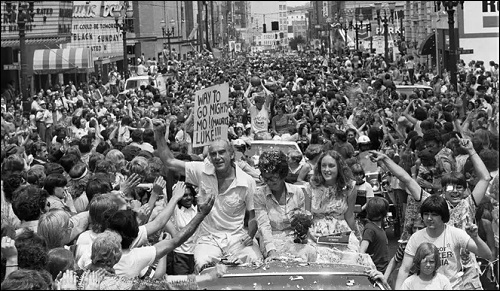 Jack Ramsay leads the victory parade through Portland. The champions celebrate in the locker room. 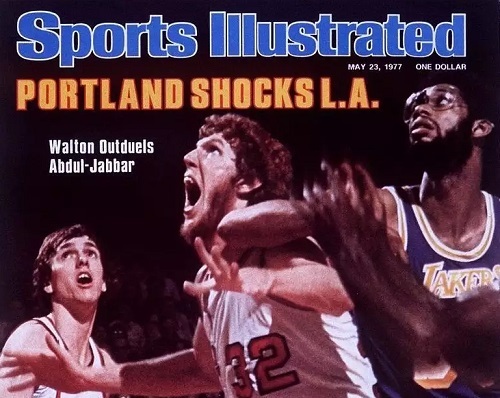 Lionel Hollins, Bill Walton and Dave Twardzik team up on the Lakers. 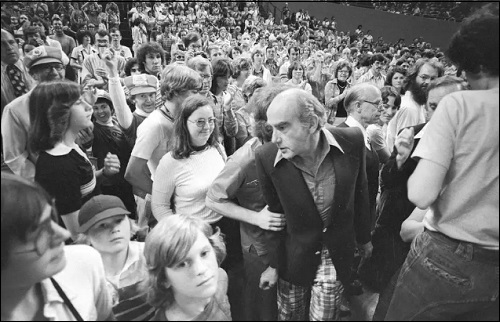 Jack Ramsay among fans at Memorial Coliseum. Maurice Lucas and Bill Walton with their teammates. 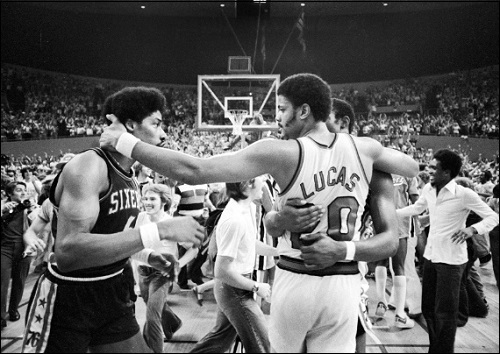 The 76ers Julius Erving and Maurice Lucas. Fans celebrate immediately after the championship is won. 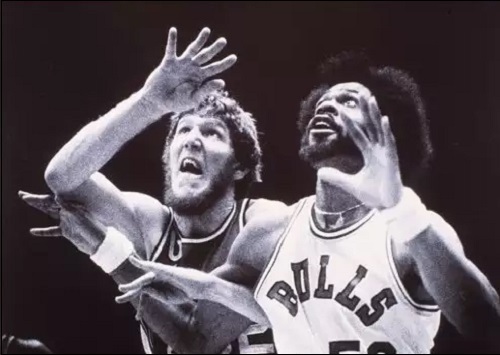 Bill Walton battles the Bulls in the first round. 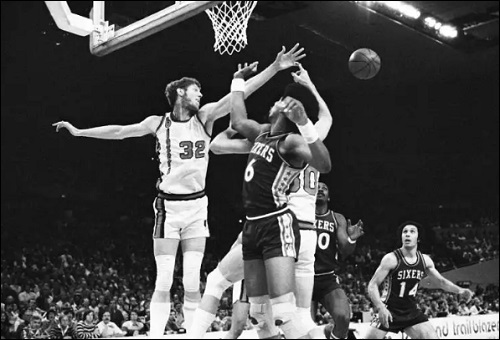 Bill Walton and Bob Gross defend the 76ers' Julius Erving. 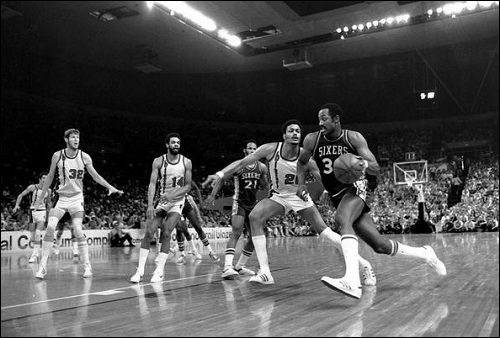 The Blazers defend the 76ers' George McGinnis. The starting lineup takes the court. Lionel Hollins, Dave Twardzik, Johnny Davis, Lionel Hollins, Jack Ramsay, Jack McKinney. Wally Walker, Robin Jones, Bob Gross. Third row is comprised of Blazers staff. That sounds like an incredible time around Portland. It would be quite a bit different right now if they were to win it. I mean, there would be a frenzy and a lot of excitement. Winning the first one and having the team so entrenched in the lives of everyone in the region. This is an incredible tribute to that team. I love the sections recapping the players once they went on with their careers and lives, and the interview with Bannock is really cool! Awesome work, Julie. Thanks for putting this together! I loved reading this detailed recap. Some amazing photos! I learned a lot of what it was like during that time. I've never quite seen anything which compares to it.